Angiogenesis is the process of building new blood vessels and is inherently coordinated with building new tissue, but increased angiogenesis can also have a deadly side effect – a distinguishing characteristic of cancer growth. 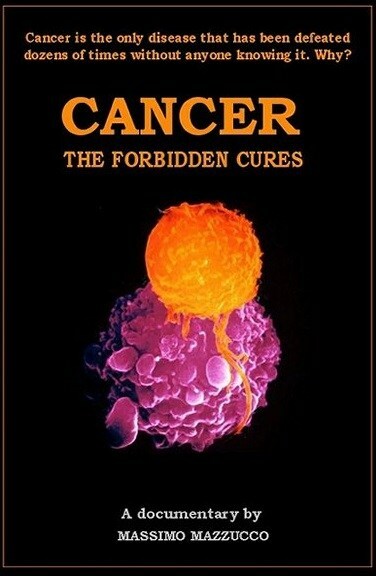 Some cancer treatments for halting the growth of cancer-feeding blood vessels have been successful in treating tumors. This term is known as anti-angiogenesis. Although several drugs have been incorporated with isolated anti-angiogenic compounds, there are more than 30 dietary sources of naturally-occurring anti-angiogenic substances. Angiogenesis plays a critical role in the growth and spread of cancer. A blood supply is necessary for tumors to grow beyond a few millimeters in size. Tumors can cause this blood supply to form by giving off chemical signals that stimulate angiogenesis. 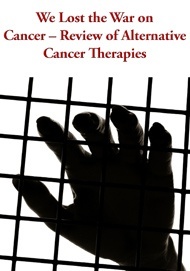 Tumors can also stimulate nearby normal cells to produce angiogenesis signaling molecules. The resulting new blood vessels “feed” growing tumors with oxygen and nutrients, allowing the cancer cells to invade nearby tissue, to move throughout the body, and to form new colonies of cancer cells, called metastases. Foods with natural anti-angiogenic compounds do not have the serious side effects which are now being found in angiogenic drug inhibitors. Dr. William Li, the president and medical director of the Angiogenesis Foundation recently spoke at a TED conference above. Data has indicated a synergistic effect of antioxidants on the anti-angiogenesis and anticancer efficacy of alliin in garlic. Curcumin causes a marked decrease in the extent of cell proliferation and is proving itself as a valuable therapeutic anti-cancer agent and anti-angiogenic substance. Bioactive compound isolated from the nutmeg essential oil have been developed as antiangiogenic drugs. Grape Seed extract as a dietary supplement, is a well-tolerated and inexpensive natural angiogenesis inhibitor. Maitake mushrooms effectively inhibit angiogenesis by blocking specific signaling and the fruiting body may be a valuable medicinal food for treatment of angiogenesis-associated human diseases. Sea cucumbers contain compounds which exerts an anti-angiogenic activity associated with inhibition of signaling, and an anti-tumor activity associated with decreased proliferation of tumor cells and increased apoptosis of both endothelial cells and tumor cells. Artichoke is said to contain 3 different cancer-fighting molecules and specifically counter angiogenesis. One of its phytochemical interferes with estrogen receptors which promotes the secretion of PSA in prostate cancer. And also has demonstrated proliferation and apoptotic proprieties and also inhibits inflammation in other studies. A recent study conducted by researchers at UCLA’s David Geffen School of Medicine shows that pomegranate extract inhibits tumor blood vessel growth. Pomegranate extract inhibits both angiogenesis and tumor growth. In vitro, pomegranate inhibited the secretion of two key angiogenesis-stimulating proteins. Recent studies suggest that naturally occurring antiangiogenic molecules present in licorice may have a role in preventing some types of cancer. Based on the research of Angiogenesis Foundation, thyme is known to be rich in antiangiogenic phenol content, including apigenic, luteolin, erodictyol, rosmarinic acid and quercetin. 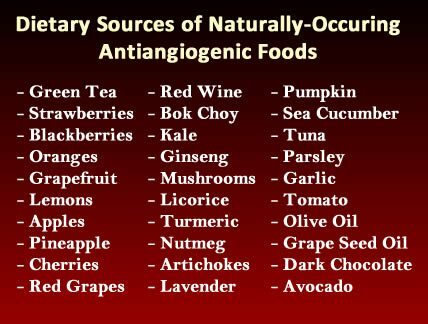 There are literally hundreds of more studies on all the foods listed above with supporting evidence that anti-angiogenic compounds within foods can prevent cancer. Let food be thy medicine.